Hold onto your hats, everyone! Today is Day Seven of Christie Wright Wild’s PB 14:14 AND Perfect Picture Book Friday. WOW! Just like the old Doublemint gum commercials. And one of the reasons I picked this particular book is that it is all about words..and this is my 550th blog post – and that’s a WHOLE LOT OF WORDS! Age Level: School Library Journal recommends it for grades 2-5, but my grandson loved it and he is a kindergartener. From Amazon: For shy young Peter Mark Roget, books were the best companions — and it wasn’t long before Peter began writing his own book. But he didn’t write stories; he wrote lists. Peter took his love for words and turned it to organizing ideas and finding exactly the right word to express just what he thought. His lists grew and grew, eventually turning into one of the most important reference books of all time. “Peter snuggled deeper into Uncle’s lap as the carriage clattered through the valleys of Switzerland. Baby Annette slept in Mother’s arms, a small pink blossom against a wall of black. Father wasn’t coming back, Peter knew. Mother’s dark dress and Uncle’s sadness proved it. The book grabs us right away with the ingenious use of different fonts for the words. So right away, we know this is a story where words are going to be of the utmost importance. The inner title page information is set against a backdrop of alphabet blocks. And the words on many of the pages are written as if in a list since lists are a hallmark of Roget’s life. 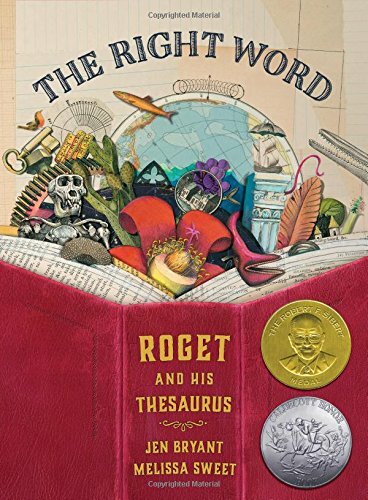 Roget was a man who was passionate about words – he wanted to find the exact right word for each thing he saw, for every emotion he felt. Make lists – toys in bin, books on shelf, friends I play with, etc. And guess what tomorrow is? That’s right…the third Saturday of the month. So please come back tomorrow for our next installment of Will Write for Cookies with author Donna McDine in the spotlight! This entry was posted in Christie Wright Wild's PB 14:14, Kristen Fulton's 52 Weeks of Charting Non-Fiction Picture Books, Susanna Leonard Hill's Perfect Picture Book Friday, Top 10 Elements of Picture Book Stories and tagged Jen Bryant, Melissa Sweet, The Right Word - Roeet and his Thesaurus, Word Play and Character in Picture Book Stories by viviankirkfield. Bookmark the permalink. Congratulations on your 550th Blogiversary, Vivian! Great choice for PB14:14 Word Play and for Perfect Picture Book Friday. Truly BEAUTIFUL book! I just can’t like that cover. I know, I stand alone, probably anyway, but it does not have the same feeling I get when I open the book. Yes, I could be content, but fear other people might pass over it because they are cover-judgers – – like me!!! I just happen to love their collaborations already. What a wonderful picture book about Roget. I love that there are so many biographies for children about famous people as children. Will check this one out. And the Doublemint video sure dates me. I remember those. I have wanted to read this book…and with this post, I am super hooked…especially by the lead. Thanks Vivian! This is a powerful picture book and so deserving of its awards! I remember getting my first thesaurus when i was about 12. Great book – great art! Worth reading and rereading as many times as you want. I have seen this book, Vivian, and it’s beautifully done. Thanks for featuring it. Way to kill three birds with one stone! Or, as my friend likes to more humanely say, ‘feed three birds with one seed.’ And congratulations on 550 blog posts – Wow! Great book choice. I’ve heard about this one, but haven’t read it myself yet, but you got me excited to go track it down, both for the story and the interesting way it’s laid out among those beautiful illustrations. Off to the library to find this one. Congratulations on 550 blog posts! 550 posts!! That sure is a lot of words!! And all of them well chosen! Mr Roget would be proud! 550! Congratulations! That’s very, very impressive! Great book choice and a wonderful review! Congratulations, again! Great blog, Vivian! I agree “words have power.” I will check out Peter’s story. I’ve got this one on order at my library. Looking forward to reading it! This is perfect for many, many lists. Glad it worked for all of your posts! 🙂 I really like this one too. It deals with a lot of issues! Wonderful work of master picture book elements. Loved your review Vivian.